The title of “Walkie Talkie,” the first track from Palm’s new EP Shadow Expert, reads like a sly joke. The song opens with a simple staccato guitar figure panned to the far right side of the stereo field. Another guitar quickly responds with an equally spartan line, this one all the way on the left. Eventually, the rhythm section takes up a rolling counterpoint, filling the gaps between those transmissions with some disjointed chatter of its own. “Walkie Talkie” offers the fullest expression yet of a particular cadence that animates much of the music in Palm’s small and electrifying catalog of deconstructed post-punk: four instruments and two singers engaged in terse but lively musical correspondence, cohering into improbable grooves that would stop making sense if just one voice dropped out of the conversation. Listening in headphones, it’s like the musicians are sending radio updates to each other across the chasm of your skull. I thought about “Walkie Talkie” during a series of brief phone calls–five of them in a period of about twenty minutes–that I exchanged with the members of Palm one afternoon a few weeks ago. We were trying, and failing, to find each other. The day before, we’d arranged via their publicist to meet for an interview in Brooklyn’s East River State Park, a small chunk of green wedged between a high-rise luxury apartment and a storage facility on the Williamsburg waterfront, not far from where the band was slated to play a release show for Shadow Expert that night. On the fifth call, we realized the problem: they had arrived at the other East River Park, a mile due west across the water in Manhattan. Instead of approaching each other from around the corner like we’d thought, we were exchanging dispatches from opposite islands. 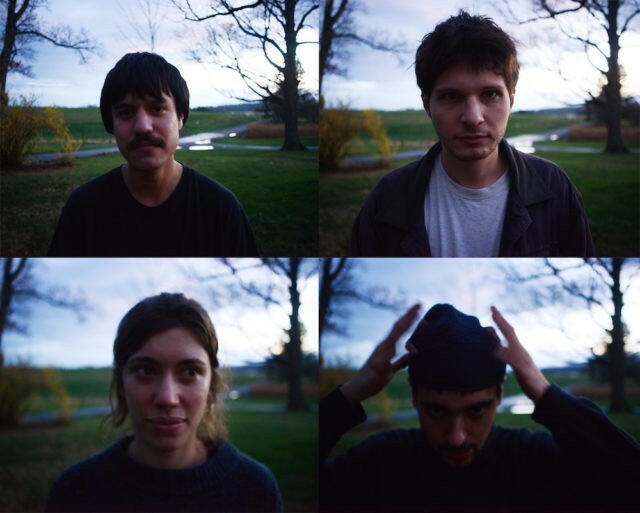 Palm is Eve Alpert and Kasra Kurt, childhood friends who both play guitar and share lead vocals more or less equally, plus bassist Gerry Livitsanos and drummer Hugo Stanley, whom they met when all four were attending Bard College in upstate New York in the early 2010s. About an hour after my first phone call with Livitsanos, three of the members arrived in Brooklyn, in the weathered green Toyota minivan that is their tour vehicle. (Stanley had another engagement.) They were unable to find a legal parking spot, so we stayed on the sidewalk just outside the park, with the van’s flasher lights going just in case a traffic cop came by. Palm’s members are all in their mid-20s, and all of them lack formal training on their respective instruments. Livitsanos was an experienced pianist and clarinetist, but had barely touched a bass guitar when the other three members asked him to join. He only acquired one when a friend traveled abroad and lent it to him. (“I’ll take any instrument,” he said sheepishly during our interview.) If they weren’t so earnest about what they do, you might take Palm’s emphasis on their own amateurishness as a bit of canny self-mythologizing. They tour for months on end, using their earnings to support themselves without day jobs during brief stays in their current hometown of Philadelphia. When they’re not on the road, Kurt says, they practice four to five days a week for several hours at a time. It shows: Though their playing is rarely outwardly flashy, Palm’s understated virtuosity is an essential part of their appeal. Trading Basics, Palm’s beguiling debut LP from 2015, could be termed “progressive indie rock,” in the sense that indie luminaries Robin Pecknold and Dave Longstreth meant it in a recent public conversation about the state of the genre–as a deliberate attempt to push the music forward. At times, it also just sounds like prog. A song from that album called “Second Ward” is illustrative of the band’s early approach: it begins as a straightforward fist-pumping anthem, veers hard left toward demonic krautrock drone, opens up with a lilting Dark Side of the Moon-style bridge, goes back into the evil drone zone, switches vocalists for a snarling riff worthy of ‘90s Touch and Go, triumphantly returns to the melodic first section, and closes with a completely new instrumental passage. It’s an odyssey that could easily stretch out for 10 minutes or more, but Palm’s punkish sense of economy keeps it to five. Palm recorded Shadow Expert’s six songs in two days immediately following the release of Trading Basics. (The delayed release, it seems, had something to do with the band’s jump from the plucky Exploding in Sound label to the comparatively established Carpark Records.) Despite the quick-fire approach, the EP is a significant step forward. The band has left behind the byzantine changes of songs like “Second Ward,” instead giving each musical idea time and space to naturally develop before moving to the next one. In the process, they’ve abstracted the signifiers of indie rock or any other genre from their sound, moving closer to a fully realized identity of their own. On hermetic and demanding songs like “Walnut,” the influence of Palm’s forebears and peers is reduced to trace evidence: a bit of Feels-era Animal Collective in the vocal arrangements, some Deerhoof in the jazzy bombast of the drums, a little Women in the way the guitars talk to each other, some rhythmic restlessness gleaned from math rockers like Don Caballero. Those comparisons are ultimately reductive, however. The music might be more usefully described in the language of visual art: the pure objects of minimalist sculpture, the cubist painter’s ability to see his subject from multiple angles at once. Alpert interrupts: “And DJ Rashad!” That last influence is telling. In their knotty and trancelike approach, Palm are the rare rock band that understands the possibilities of bleeding-edge electronic genres like footwork without explicitly trying to sound like them. Palm’s work ethic has a match in their creative restlessness. For the last year and change, they’ve been playing a set of almost entirely new material, with just a few reworked versions of songs from Trading Basics and Shadow Expert scattered in. They’ve already got another full-length album in the can, recorded in April, which they expect to release early next year. “Shadow Expert is kind of a stepping stone between the first record and what we just recorded,” Kurt says, and Alpert adds that the forthcoming release has “better songwriting overall” than anything they’ve done in the past. Informed by the likes of DJ Rashad, they’re employing a slightly expanded palette, with Kurt triggering a variety of synthesized sounds to complement his bandmates’ instruments. He’s not playing a traditional keyboard, however, or standing behind a laptop, but using a MIDI pickup: an electronic device installed in that old familiar workhorse, his electric guitar.